Delve into Normandy’s heritage from your base in the picturesque harbor town of Honfleur. Explore 20th-century history during visits to key sites of the Allied forces’ D-Day invasion 75 years ago. Consider the impact of World War II during a poignant visit to the Normandy American Cemetery. Journey back to the Middle Ages through the intricate Bayeux Tapestry, and explore the famed island abbey of Mont St. Michel. Along the way, admire centuries of architecture, and indulge in delicious regional fare. You’ll stay at the Mercure Honfleur Hotel, located in the historic district. Battle of Normandy: Commemorate the 75th anniversary of World War II’s Operation Overlord as you spend two solemn days along the Normandy beaches where the invasion took place. 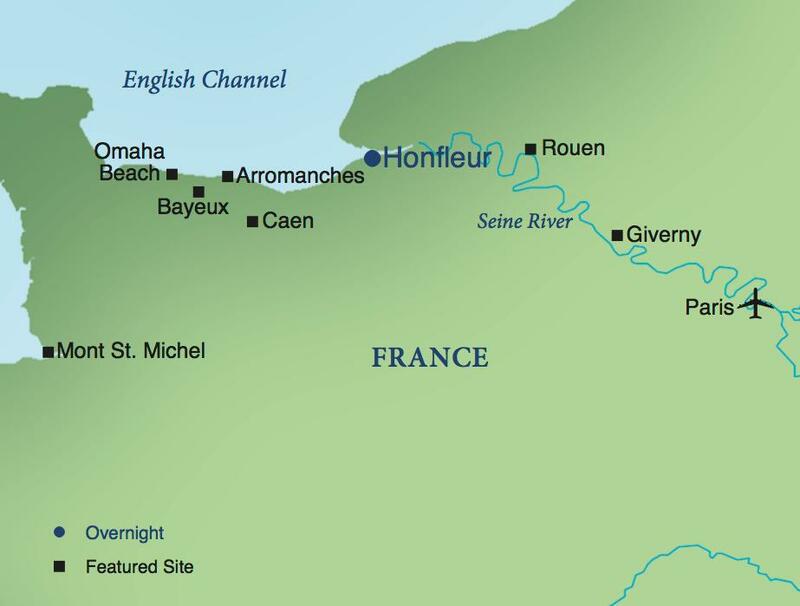 Stirring sites include Utah Beach; Omaha Beach; Arromanches; Pointe du Hoc, where U.S. Rangers scaled the cliffs to take out the German gun emplacement; and the town of Ste-Mère-Église, where U.S. paratroopers dropped into the village. You’ll visit the Caen Memorial and Museum, which focuses on World War II, the D-Day Landings, and the Cold War through a variety of exhibitions. Other important museums that bring additional insight include the Utah Beach Landing Museum and the Arromanches Museum. To honor the many brave soldiers who gave their lives, you’ll also visit the U.S. Military Cemetery at Colleville-Sur-Mer. Artistic Legacy: Travel to Bayeux to view the embroidered story of William the Conqueror’s victory at the Battle of Hastings in 1066. The Bayeux Tapestry, nearly 230 feet in length, offers historians insight into the battle as well as the weapons, clothing, food, and other details of daily life in that age. Surround yourself with the same views that inspired Monet and other great Impressionist painters at Honfleur’s Old Harbor and other sites. Mont St. Michel: Discover this breathtaking tidal island with its iconic abbey and historic church (founded in 709), which is one of the most remarkable sites in France and a World Heritage site. Cultural Traditions: Savor traditional culinary products such as Calvados (a fortified apple brandy), and visit a nearby estate farm to sample Norman cheeses. Depart the U.S. on the overnight trans-Atlantic flight to Paris, France. After arrival at Paris Charles de Gaulle Airport, drive through the French countryside to the Mercure Honfleur Hotel. A rest stop will be made en route. Upon arrival at the hotel, you’ll receive a Welcome Kit with maps and general information about Honfleur and the province of Normandy. 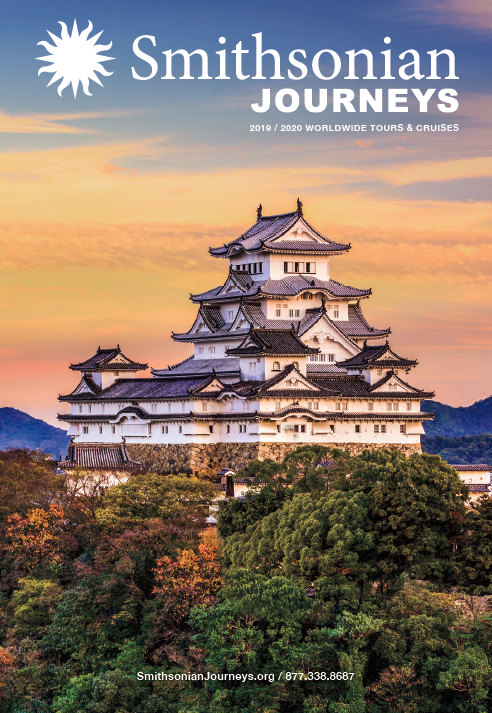 The Smithsonian Journeys Travel Director will be available this afternoon and throughout the program for suggestions regarding tours, restaurants and independent activities. A full buffet breakfast is included each morning at the hotel. Excursion: Start discovering Normandy with a drive into the countryside and a local estate farm where you’ll sample Norman cheeses and renowned locally produced cider. Excursion: After lunch, get to know historic Honfleur, a quintessential French port town that has captivated artists for centuries. Soak up the maritime ambiance of it's picture-perfect, 17thcentury Vieux Bassin, or old harbor. Stroll along narrow side streets to see landmarks like the wooden Church of Sainte-Cathérine, crafted by 15th-century shipbuilders. Excursion: One of the most iconic sights on the Atlantic coast of France is the tidal island of Mont St. Michel. Well known, the world over, the abbey’s spire can be seen for miles around. In the 1300’s, the island was fortified to protect it from opposing armies, and at one point in history, the island was a local prison. Lunch featuring local specialties will be at leisure. Excursion: Travel to visit the Peace Memorial at Caen that showcases 20th-century history including World War II, the D-Day Landings, and the Cold War through a collection of exhibits, photos, and video. Local Flavor: Normandy’s famous apple cider brandy is among the world’s finest brandies. Visit a farm that distills Calvados from the apples grown on its 42 acres of orchards, and learn about the process. Relax over lunch on the farm, and then sip a glass of smooth Calvados. Independent Exploration: Enjoy a day that is free of planned activities. Make your own plans around the area. Educational Focus: This evening a local speaker will talk about the role of the French Resistance its origins, its leaders, and the heroic efforts of the French patriots who fought to liberate their country and the lead-up to the D-Day landings. Educational Focus: Begin the day with a talk by a local expert on the fascinating history of Normandy and how it's citizens played a role during this crucial period of the Allied war effort. Excursion: Afterward, embark on an emotional and fascinating journey to the sites that were so pivotal to the success of the Allied armies on D-Day. In Arromanches, see the site of one of the offshore mulberry harbors, and visit the museum. These floating harbors were an engineering triumph and a clever solution that enabled the Allies to funnel enormous resources into France to wage war against Hitler. Break for lunch in Arromanches. As you walk along Omaha Beach Memorial, contemplate the extraordinary bravery of the Allied landing forces, who valiantly advanced under devastating fire across the heavily fortified shoreline to overcome German troops. Motor along to the Calvados coastline, which provided the theater for Operation Overlord, history’s most complex and most important military initiative. Excursion: Travel to Bayeux to see the Notre Dame Cathedral, one of the finest examples of Norman Gothic architecture in the world. Continue to see the 200-foot long Bayeux Tapestry, a masterpiece that depicts the glory of William the Conqueror and the Battle of Hastings fought in 1066. Day 9 — Depart for the U.S.